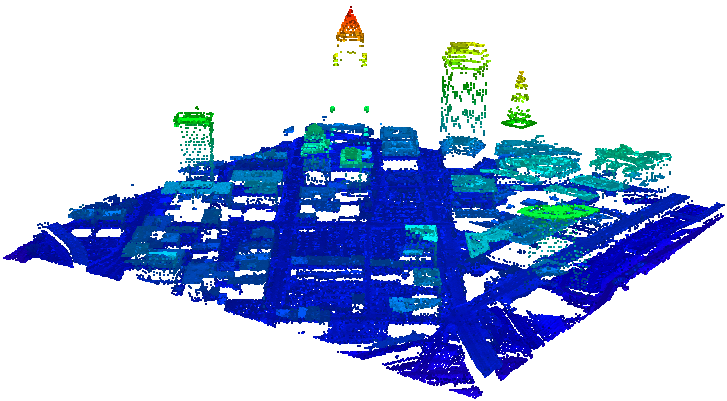 Point clouds are a collection of points that represent a 3D shape or feature. Each point has its own set of X, Y and Z coordinates and in some cases additional attributes. We can think about a point cloud as a collection of multiple points, however, that would be oversimplifying things. Surprisingly, when many points are brought together they start to show some interesting qualities of the feature that they represent. Point clouds are most often created by methods used in photogrammetry or remote sensing. Photogrammetry uses photographs to survey and measure an area or object. A combination of photographs taken at many angles can be used to create point clouds. Remote sensing is a way of collecting data of the Earth by use of satellites or aircrafts. On these aerial vehicles, LiDAR sensors can be mounted to collect information about the shape of the Earth and its features. LiDAR stands for “Light Detection and Ranging”. This technology can be mounted to aerial vehicles to send laser pulses to the Earth’s surface and once the laser returns back to the sensor, the LiDAR system will record data based on information received. The LiDAR system requires many components to record such data, like a GPS, so that each point will have accurate data attached. Additional information like intensity, flight angle, or even class may be recorded. The resulting point clouds of the LiDAR collection method are saved in the .LAS file format. FME supports both reading and writing point cloud data. In FME, attributes for points are called components which can represent time, flight line, intensity (how much light returns back from a point), color, etc. Workflows can be created to use these components to create rasters, 2D features, or even 3D surface models like DEMs or TINS. There are a variety of point cloud specific transformers that will even allow for you to make small changes like thinning your point cloud to reduce file size, or splitting and filtering a point cloud by components. With the ASPRS LAS Writer you can even create new point clouds from other 3D data that you have. To learn more, please visit the Knowledge Center to view a variety of articles and tutorials that will show you how you can use point clouds in FME.